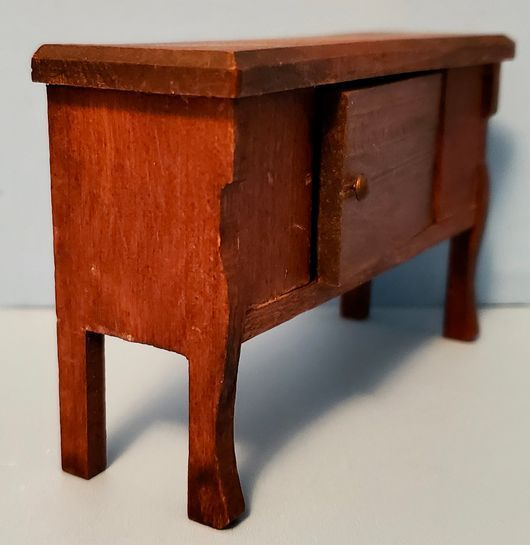 Sweet little sewing corner set includes a Red Stain German sewing stand with a double sided sewing box that opens from both sides. It has lovely turned legs and a paper sticker on the bottom that reads "GERMANY". One leg has and old repair. 3 1/2" tall, 2 7/8" wide, and 1 3/8" deep. The over stuffed easy chair is cloth covered cardboard with lovely tiny printed fabric with a ruffled shirt. There is a very tiny mark in the fabric on the front edge of the seat. 5 7/8" long by 4 1/8" wide.